A while back, I posted about getting my samples of Rockin' Green cloth diaper detergent. I said that I took pictures, and that I would post about it. Then I proceeded to Not Post. Now that I'm home and I'm procrastinating a) packing and b) sleeping, I thought I would compile my images for your viewing enjoyment! 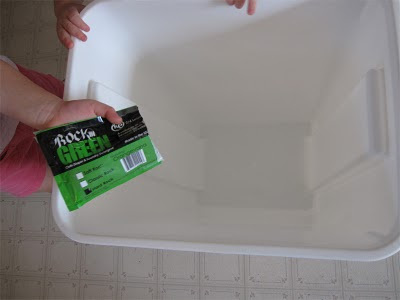 The methodology, as proposed by the detergent gurus over at Rockin Green Soap, (which is really a detergent and not a soap) is to add 3 tablespoons of detergent to a top loading washing machine or 5-6 tablespoons of detergent to a bathtub, add hot water, add diapers, and let soak for 30-60 minutes (or longer, like overnight!). Since neither tub nor washer were good options, I used my diaper pail, and 3 tablespoons of detergent. My kids wanted to help on this project. 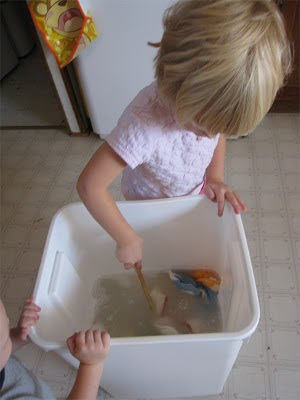 Notice the nice product placement while pouring the detergent in the pail? Both were curious about what Really is going on here. They may have suspected some imminent child labor. They might have been right about the child labor. 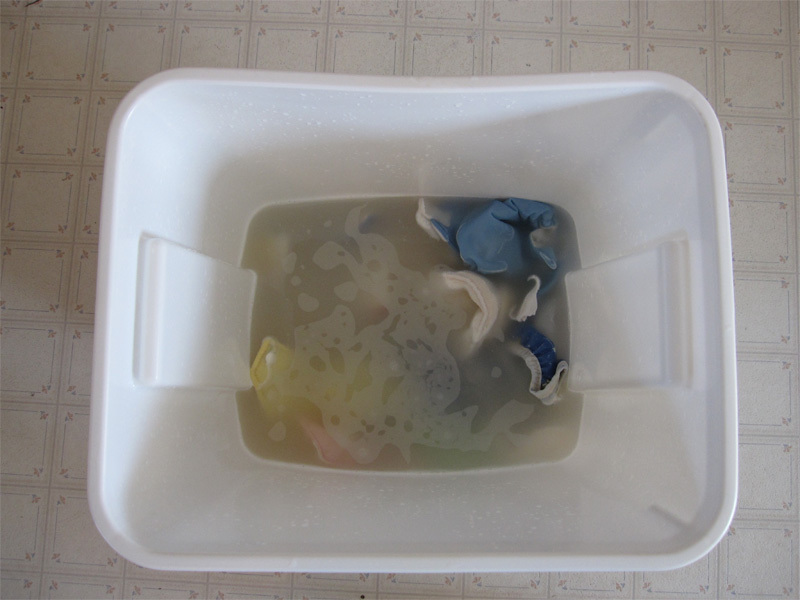 Here are the diapers I was soaking. 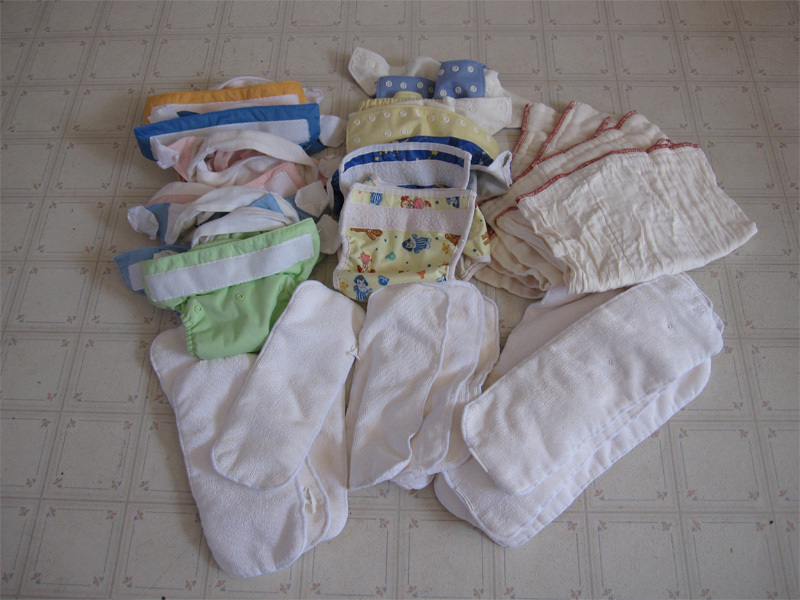 I had taken some photos of similar diapers to attempt a before and after, but really, I couldn't tell a difference in the appearance of the diapers. I have 5 BumGenius 3.0 onesize pocket diapers and inserts, 2 Fuzzibunz onesize pocket diapers and inserts, 2 old Bummis superwhisper wraps (like, 3 years, and LOTS of use! 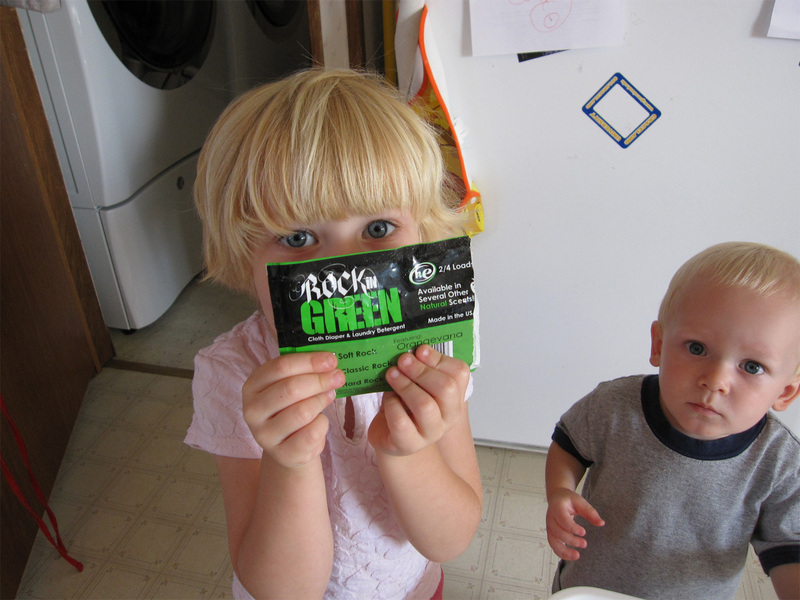 ), and 3 red edge Green Mountain Diaper organic prefolds. They all are "clean" diapers. 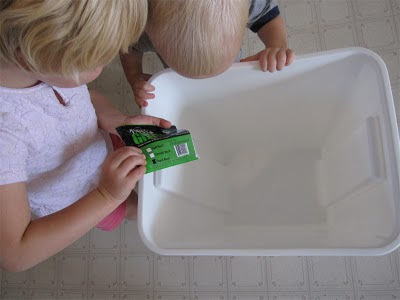 My slave labor helpers adding diapers to the pail. I filled the pail about halfway with water. I would guess it was in the realm of 5 gallons of water. 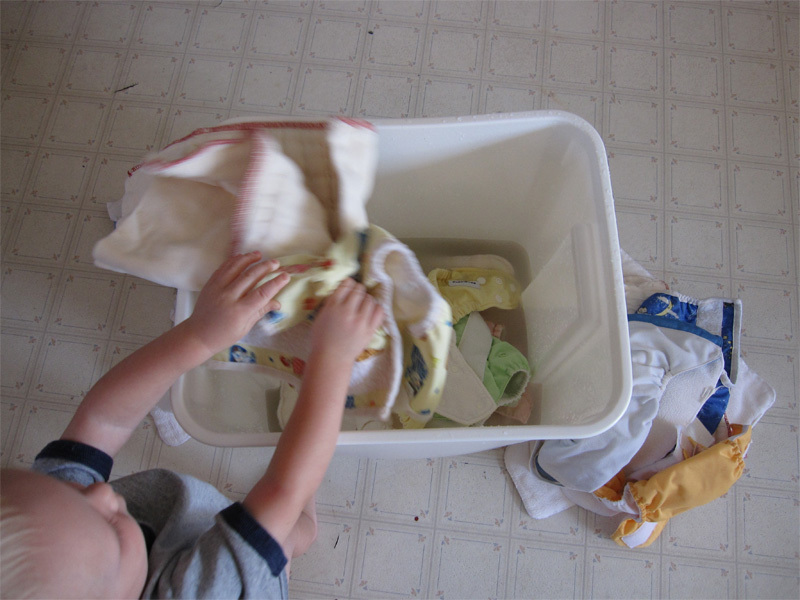 Helpers stirring the diapers around to get them properly agitated. Really, is there a proper way to agitate diapers? I much prefer them to be happy. Sitting. Waiting. The water looks kind of icky, right? Well, really, that's just what happens when you take slightly cloudy water (because the detergent made it cloudy), and add colored items. It changes the appearance of color without actually changing the water. See the samples a few photos down. 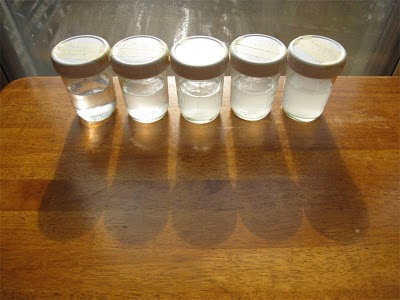 I decided to take water samples during my investigation, as I felt that would a better comparison of what is actually getting out of the diapers, and into the water. I couldn't really see much difference between the 1 hour sample and the 10 hour sample. I think it's more telling to look at the amount of light that can pass through the suspension. Look at the table in front of the jars. 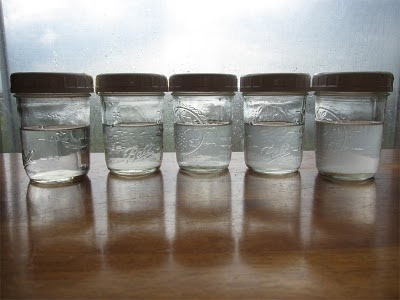 Clearly, after 10 hours there is more to block the light in the jar than in the 1 hour jar. It would certainly seem that soaking made a difference in getting stuff out of the diapers. It would also seem that the longer the soak was, the more stuff came out. The real test is the morning smell test, which has been positive. Er. Negative. No smell, that is. 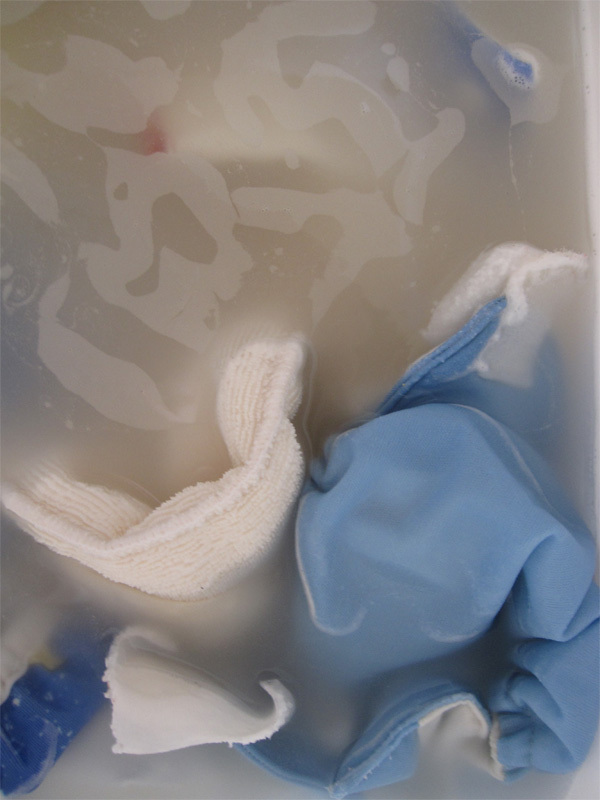 I may have found a night-time stink solution, in my detergent! And, a bonus for me: I won a bag of RnG detergent in a giveaway, so now I can really give a solid trial, and see what happens! I plan to go back to a more "normal" wash routine - only spraying off poopy diapers, everything else going straight into the diaper pail, doing just one or two extra rinses (as opposed to several additional wash cycles).